The microtunnel drives were located up to 14 metres below ground surface and excavated with an MTBM on a grade of approximately 0.15 percent. The Regional Municipality of Halton Pumping Station Master Plan was prepared to identify different upgrading alternatives. The preferred alternative selected in the Master Plan was the construction of a deep trunk wastewater main from the Urban Growth Centre to the Oakville Southwest Waste Water Treatment Plant. The trunk wastewater main relieved the existing constraints along the existing 900-mm Rebecca Trunk Sewer and allowed for decommissioning of a number of existing wastewater pumping stations by redirecting flows from the pumping station sub-catchments to the new trunk sewer. The Rebecca Trunk Wastewater Main Construction Project consisted of 4.13 kilometres of 1,200-mm ID and 1,350-mm ID pipe constructed through microtunnelling. 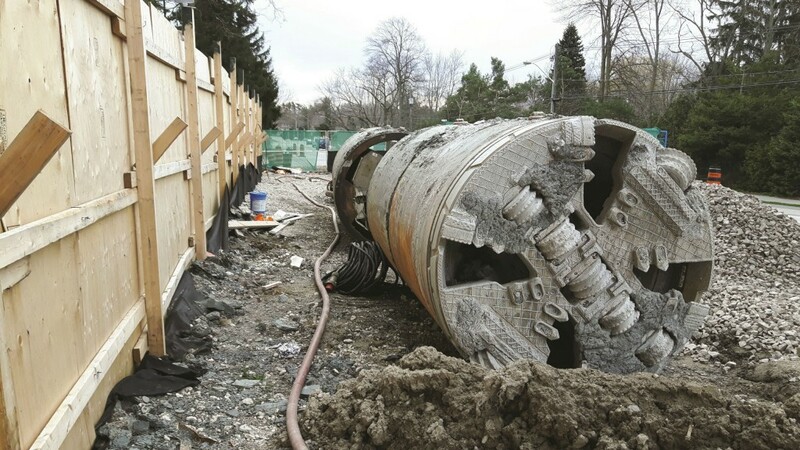 It comprised seven jacking pits, eight receiving pits and 14 microtunnel drives between the Oakville SW Wasterwater Treatment Plant (WWTP) and the West Abutment of Sixteen Mile Creek at Forsythe Street. The microtunnel drives were located at depths up to approximately 14 metres below the ground surface and were excavated using a slurry microtunnel boring machine (MTBM) on a grade of approximately 0.15 percent. With the exception of two of the microtunnel drives (mixed face), microtunnelling was through rock. All the curved drives included an initial straight section of at least 10 metres prior to commencing a curve section. Many of the curved drives also incorporated multiple curves of varying radii (composite curves). Microtunnel access to the ground surface was via jacking pits and receiving pits. The jacking pit work areas were used as the base for microtunnel construction operations and the receiving pits were used for retrieval of the MTBM following completion of each microtunnel drive. Jacking pits and receiving pits were excavated using a combination of mechanical equipment above and below the top of the bedrock surface (below top of rock). No blasting was permitted during construction. A section of open cut pipeline was constructed to facilitate tie-ins to the Oakville Southwest WWTP located at the western end of the alignment. The Halton Region is located within the Niagara Escarpment physiographic region. The escarpment bisects the Region on a north-south axis and represents an erosional landform created by glaciers and water differentially eroding the rock strata comprising the escarpment. The rock formations in the region include the shallow-dipping Ordovician age Queenston and Georgian Bay Formations. The Queenston Formation comprises predominantly red, hematitic, fissile, micaceous calcareous shale. The Georgian Bay Formation comprises grey-green shales with interbeds of sandstone, grey-green siltstone, and grey argillaceous limestone. The surficial geology is represented by glacier and glacial lake sediments/soils although more recent alluvial (stream) and organic deposits are also common. Below the escarpment, the rolling plains overlying the Queenston Formation consist primarily of thick silty to sandy clay till referred to as the Halton Till. A geotechnical baseline report was prepared for the project. The frequent grinding of augers and the high SPT N-values recorded during drilling indicated that cobbles and boulders as well as rock slabs and fragments, derived from the weathering of the underlying rock, were present in the soil units. The maximum dimension of the boulders was up to 1,000 mm with a maximum strength of 200 MPa (29,000 psi). The Boulder Volume Ratio (the ratio of the total volume of all boulders to the total volume of excavated soil) was 0.50 percent. All of the soils had medium to low clogging potential. Curved alignments - Due to the limited availability of jacking and receiving pit locations, presence of overhead utilities, limited potential for lane closures, areas of highly congested underground utilities, and required alignments at creek crossings, curved microtunnel drive alignments were incorporated into the project design to limit the number of pits, reduce the size and number of easements required, and limit impacts to businesses and residents. The curved alignment design required special consideration of eccentric/non uniform jacking forces (calculated in accordance with ASCE 27-00 – Standard Practice for Direct Design of Precast Concrete Pipe for Jacking in Trenchless Construction), minimum allowable radius (for 1,200-mm and 1,350-mm pipe), maximum allowable pipe length (for 1,200-mm and 1,350-mm pipe), minimum required overcut, and maximum allowable joint deflection on curves to maintain required watertightness. Time-dependent deformation – The Georgian Bay Formation (shale) is known to possess high horizontal stresses and time-dependent deformation. Upon relief of the high horizontal stresses in the rock, time-dependent creep-like deformations persisted beyond the initial elastic deformations and typically exceeded the magnitude of the elastic movements. During microtunnelling, the excavated rock envelope was sealed using bentonite and swell suppressing additives (e.g. CETCO HYDRAUL-EZ) injected at the tunnel face and via grout ports in the microtunnel pipe during pipeline installation in order to fill the annular space between the outside of the pipe and the excavated rock surface. The filling of the annular space limited the availability of water and thereby limited the ability for swelling to occur. The injection of bentonite and swell suppressing additives into the annulus during mining operations, and performance of contact grouting using low strength grout following completion of mining operations, limited swelling of the rock, reduction in overcut and loading on the pipe. Hard rock layers – Limestone/siltstone (“hard layers”) layers within the shale were encountered during microtunnelling. This increased cutter tool wear and tool cutter damage, and reduced penetration rates. The broken nature of these layers caused localized face instability and behaved like cobbles or boulders. Adequate slurry line capacity, properly sized muck openings, crushers and access to the face were provided. Gauge cutter wear and rate of jacking force was monitored during microtunnelling as excessive wear of the gauge cutters would have resulted in reduction of the overcut and potential for an increase in jacking forces. 14 Mile Creek crossing – Due to the limited ground cover at 14 Mile Creek and the permitting requirements placed upon the design team for long-term protection of the creek bed from scouring, a pre-engineered solution to mitigate long-term impacts to the shale bedrock in the creekbed was evaluated. The pre-engineered solution included excavation of the creek bed, installation of a box culvert, backfilling around and over the box culvert with concrete to reinstate creek bed profile, and infilling of the box culvert with low-strength concrete. This box culvert was tunnelled through by the MTBM during mining for Drive 4. The slurry rheology following mining through the low-strength concrete inside the box culvert was tested during construction and the slurry properties were modified as necessary. When concrete is ingested by the slurry system, the calcium in the concrete “kills” the hydration effect of the bentonite in the slurry water and viscosity is significantly reduced, potentially leading to destabilization of the face in poor ground at some distance beyond the concrete fill. The entire slurry system should be replenished with new water after passing the concrete to improve bentonite hydration and viscosity. After being awarded the $42.8 million microtunnelling contract, Ward & Burke – which had significant experience with curved drives and local experience in the Greater Toronto Area (GTA) mining through the Queenston Shale and Georgian Bay Formation – proposed extending five of the microtunnel drives, thereby removing five receiving pits and reducing the number of drives from 14 to nine. The use of additional intermediate jacking stations was included in the proposal. The design change was approved and the benefits include reduced impact and disruption to businesses and residents, fewer expensive utility relocations, and fewer tree removals. Construction started in December 2015 with preparation of works areas, traffic control, construction of jacking pits and receiving pits using reinforced concrete caisson shaft construction methods, and installation of geotechnical instrumentation. Currently four drives have been completed, totalling 2.44 kilometres, including Drive 1 (382 m), Drive 3 (576 m), Drive 5 (567 m), Drive 8 (588 m) and Drive 9 (328 m). Left to be completed are Drive 2 (642 m), Drive 4 (516 m), Drive 6 (315 m) and Drive 7 (187 m). “Ward & Burke completed the longer drives with normal mining process without any extra treatment. Their lubrication system (bentonite slurry) worked well and they completed the entire drive without using any interjacking stations, maintaining the uniform jacking pressure,” said Khurram Afzal, a project manager with Cole Engineering. Afzal noted the main challenge of the job was completing the curved alignments, which Ward & Burke overcame using their previous experience, including installation of a curved microtunnel around the G. Ross Lord Dam and Reservoir in Toronto – which became the tightest-radius curved microtunnel to be built in North America (see March/April 2016 issue of CUI for the full story). The project is scheduled for completion in December 2016. Khurram Afzal is project manager at Cole Engineering Group. Mark Bajor is project manager at Region of Halton. Paul Headland is vice president of Geological Services for Aldea Services LLC. Ward & Burke combined some of the drives, reducing the total number from 14 to nine, and removed five receiving pits.